In 2014 in Europe 25,964 people died in road traffic and 203,500 were seriously injured. However, the long term safety trend has been positive, especially so for car occupants who have benefitted more than other road users from road safety measures adopted over the past decade. There were 12,345 car occupant deaths in Europe in 2012 compared with 27,700 in 2001, a cut of 55%. Other road user deaths fell by 41% over the same period. Although the reduction in deaths may be a result of many factors, including better enforcement, changing behaviour and safer infrastructure, there is little doubt that improved vehicle safety standards since the late 1990s have played an important role. Improvements in the safety of new vehicles in Europe have been driven by mandatory EU and UNECE safety requirements for new vehicles and by Euro NCAP (the European New Car Assessment Programme), a voluntary consumer testing organisation that carries out its own tests of many vehicles that sell in large numbers and awards safety ratings to them. 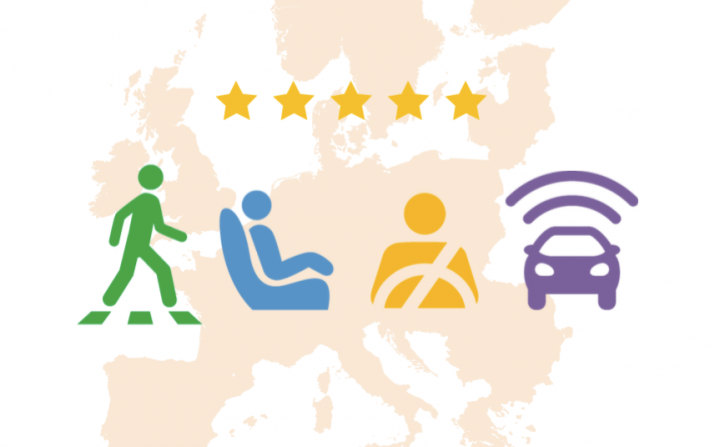 Euro NCAP’s evolving 5-star safety rating has come to represent the safety gold standard in Europe. The crash tests carried out by Euro NCAP are stricter than those required by regulation – and have also become stricter over time. A car that only meets the minimum legal EU safety requirements would receive a zero-star Euro NCAP rating. Since 2009, cars must perform well across four ‘boxes’ – adult occupant protection, child occupant protection, pedestrian protection and safety assistance systems – in order to receive the top 5-star rating. One important indicator of the level of vehicle safety in Europe overall is what proportion of the number of tested vehicles actually sold meet Euro NCAP’s highest safety ratings. The last assessment of the progress of the Euro NCAP programme carried out by ETSC in 2009 found that there were very significant differences between the average Euro NCAP rating of new cars sold in Eastern and Central European countries, compared to their Western European counterparts. Part I of this report gives an overview of how Euro NCAP’s car assessment protocol works. Part II contains ETSC’s updated analysis on what proportion of tested cars sold have a Euro NCAP rating, what ratings those vehicles received, and how they performed in each of the four boxes mentioned above. Part II also looks at what can be done at national level. Part III continues the data analysis with a look at how individual car brands are performing. Part IV briefly discusses some of the questions raised by the dominance of the Euro NCAP programme in EU vehicle safety: it looks at the pros and cons of laboratory tests versus real world crash analysis and examines the issue of optimisation to meet laboratory tests. In part V, the analysis looks ahead to the European Commission’s forthcoming review of the General Safety Regulation and Pedestrian Protection Regulation, the key legislation for vehicle safety in Europe, and makes a series of recommendations. Finally, part VI features an interview with Michiel van Ratingen, the secretary general of Euro NCAP, where he responds to the findings of this report and gives details to the changes the organisation had made to its testing protocol as of January 2016.